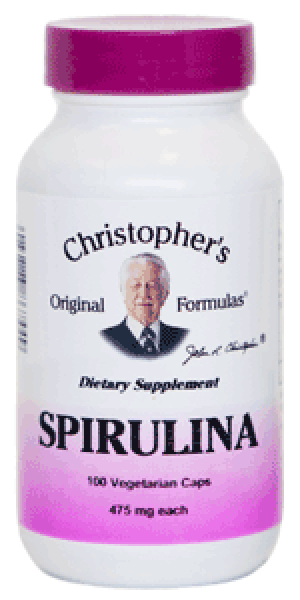 Dr. Christopher's Spirulina is a highly concentrated source of protein, vitamins and minerals, carotenoids, essential fatty acids, and other vital nutrients. Spirulina contains naturally high quantities of whole food iron and many vital trace minerals needed by the body. Spirulina or blue green algae is one of nature’s finest concentrated whole foods. Description: Blue green algae, of which spirulina is a well known example, is a group of over one thousand five hundred different species of tiny microscopic aquatic plants. Today, spirulina is consumed as a health food and nutritional food supplement. It is a highly concentrated source of protein, vitamins and minerals, carotenoids, essential fatty acids, and other vital nutrients. Spirulina contains naturally high quantities of whole food iron and many vital trace minerals needed by the body. Spirulina or blue green algae is one of nature’s finest concentrated whole foods. Encapsulated in 100% vegetarian capsules.